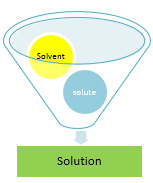 A solution, whose solvent is water, is called an aqueous solution. How can you determine if a substance is soluble? It should be polar—since what is polar. You can also use the solubility rules to determine solubility for most ionic compounds, made of metals and nonmetals, called salts.